You can roast ‘em, you can bake ‘em, and you can grill ‘em, but nothing tantalizes the taste buds quite like a crispy, fried chicken sandwich. 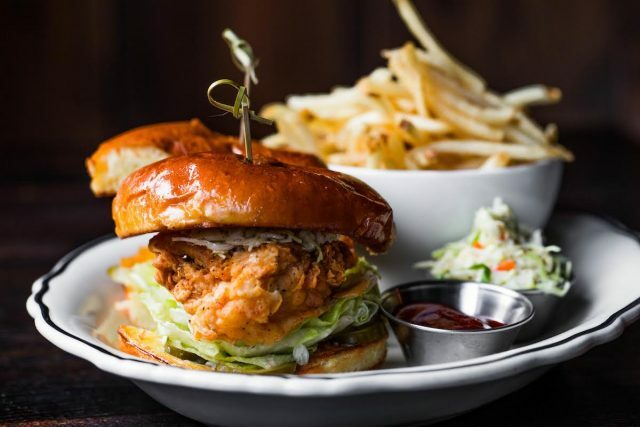 Lettuce appreciates the nostalgia of good fried chicken, and we’ve rounded up some of our favorite fried chicken sandwiches from our restaurants including M Burger, Big City Chicken, R.J. Grunts, Bub City, and Ema. While the classic taste of good fried chicken is undeniably familiar, it turns out, it’s not so easy to re-create at home. 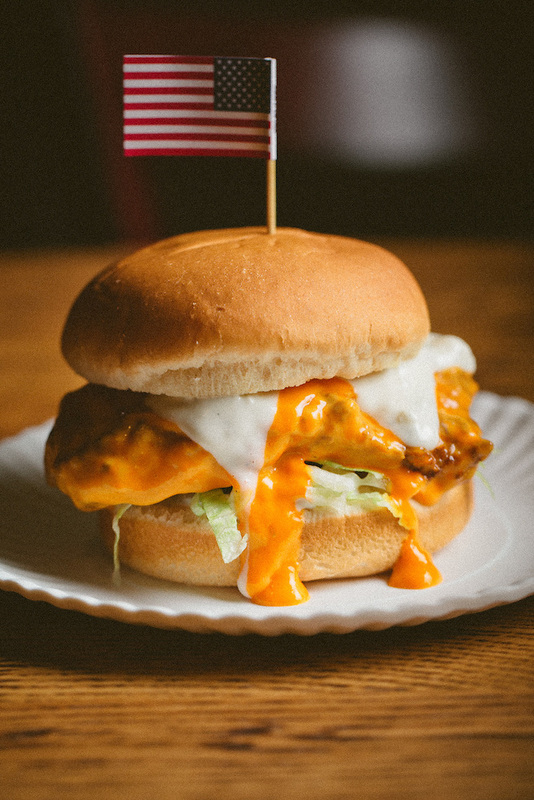 Chef Tim Hockett of Big City Chicken and M Burger offered his expert tips to achieving that perfect, golden, crisp chicken crunch. Initiate salivating now. When frying chicken, what’s the best way to start? TH: Always start with a great piece of chicken. Lay the breast on a cutting board and give it a little pounding with a mallet or wine bottle. This will tenderize it and add nooks and crannies, which help the flour stick (ensuring crispiness) and allow the brine or marinade to penetrate, seasoning the chicken. 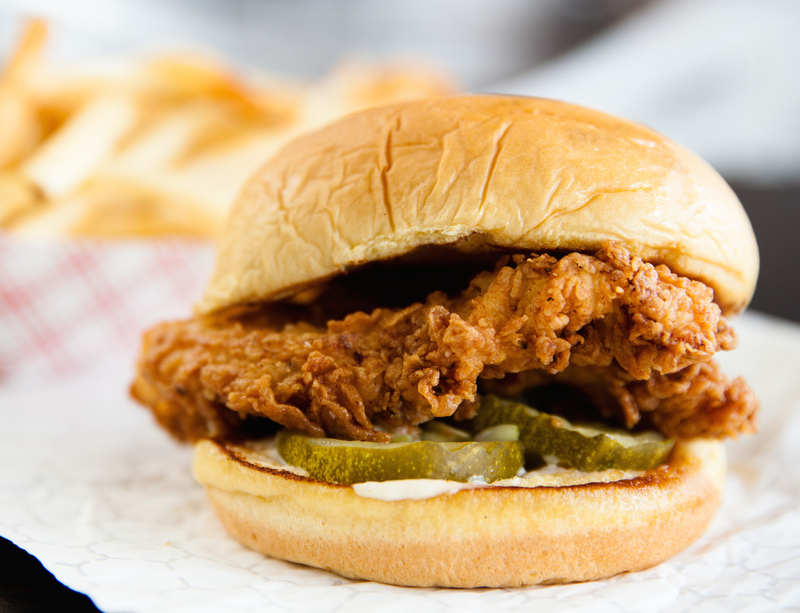 One of the keys to a great fried chicken sandwich is the meat to crispy ratio. When you pound it out a little bit you will get less meat and more crispiness—always a good thing! TH: A marinade or brine is key for a great chicken sandwich. At Big City Chicken we marinate in buttermilk for up to eight hours, however, if you want to do it more of a ‘Nashville-Style,’ throw the breasts in some pickle juice with a sliced jalapeño or two. Then just let it sit for a couple hours. What’s the perfect mixture for the breading? TH: For the breading, mix some flour with your favorite seasonings. I always love garlic powder, onion powder, salt and pepper. A while ago I found a great recipe from Colonel Sanders’ wife, it was so simple but packed with a ton of flour, that’s usually the base I build all my other recipes on. If you want to a different route, mix a little cornmeal or masa harina (a traditional Mexican flour) with dried chilies to the mix. The cornmeal will make it feel a little more southern-style. Sounds delicious. 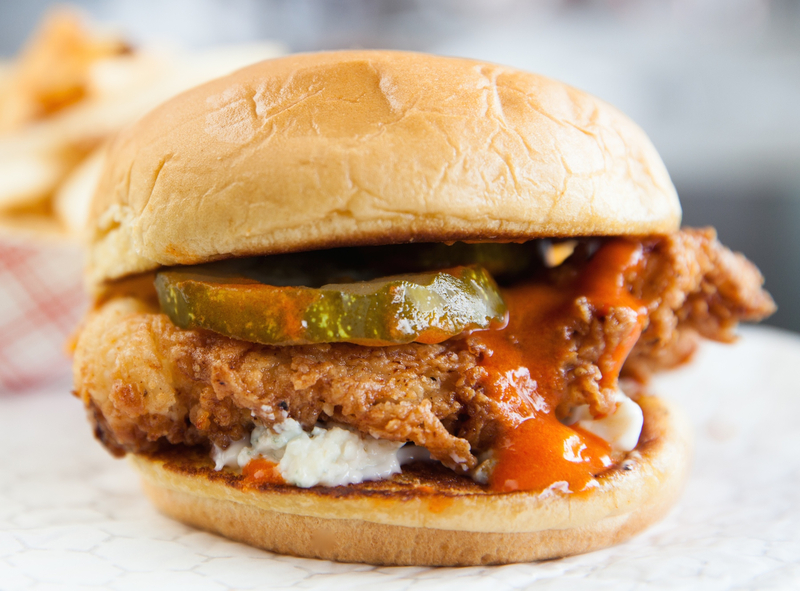 Now the key to a fried chicken sandwich? The frying. TH: To fry perfectly crisp, use soybean oil which will allow the flavors and seasonings of your choice to stand out. Heat the oil until 350 degrees—if you drop a little flour in the oil it should sizzle and foam up. Fry until golden brown (about three minutes), then lay on paper towels and pat to absorb the extra oil. Drooling. Ok, now what are your favorite toppings and condiments for such a sandwich? TH: To build the perfect fried chicken sandwich, you need a sturdy bun. At Big City we love a Martin’s Potato Bun. For toppings, simple is better— a couple crisp dill pickles and a tangy mayonnaise and you are good to go. However, feel free to also get a little adventurous! If you want to go more Chicago-style, then toss in a spicy hot sauce. Like BBQ? Top with jalapeños and a good homemade BBQ sauce. And don’t forget Buffalo-style—it’s one of our favorites with traditional Buffalo sauce and a good blue cheese. Anything at Big City Chicken. 8-Buck Cluck from Bub City – fried chicken cutlet served original, buffalo or Nashville hot. 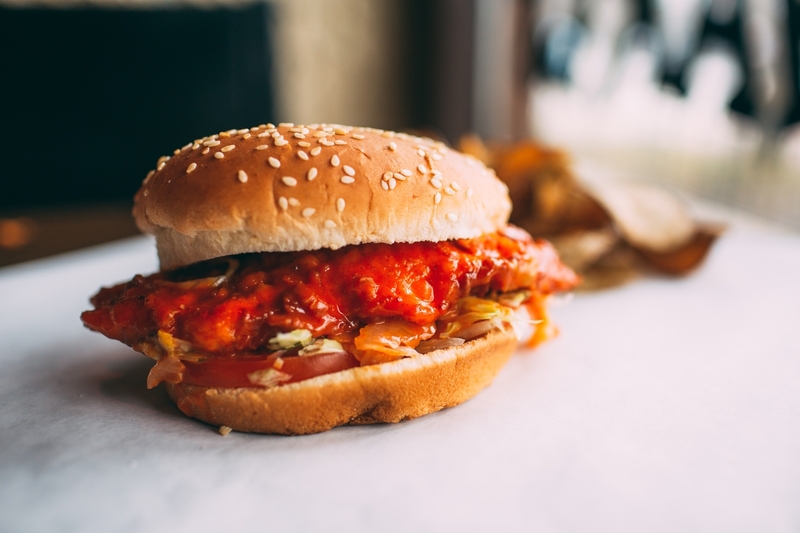 Buffalo Chicken Sandwich from R.J. Grunts – crispy chicken sandwich with lettuce, tomato and buffalo sauce on a sesame bun. 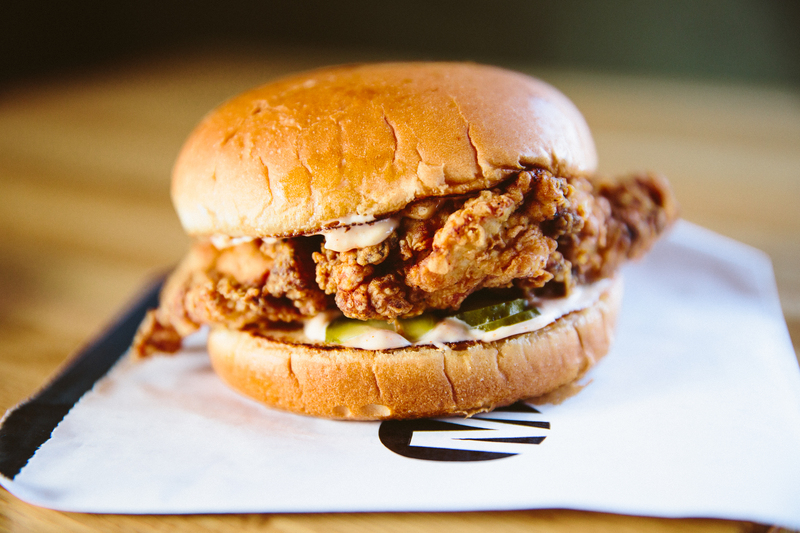 Crispy Chicken Sandwich from M Burger – hand-breaded, buttermilk batter, pickle and tangy mayo. 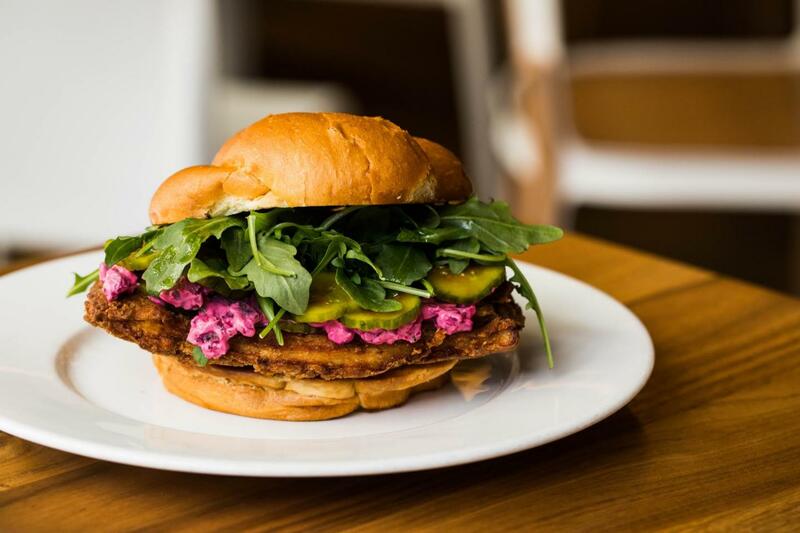 Fried Chicken Sandwich from Ema – beet tzatziki, israeli pickles, and arugula on a fluffy piece of challah. Add an egg for $1.50. This item is only offered at brunch time. Crispy Chicken Sandwich at Oyster Bah with Miller’s Farm organic chicken, double battered and fried crispy to order then sandwiched in between mayo and dilll pickle. Served with a side of coleslaw and fries. Spice it up with chef’s housemade Four Letter Hot Sauce or enjoy it half off during happy hour! Nothing is better than sipping on Champagne with your fried chicken. Find out why!